How your products look along with how they feel are two of the major driving factors behind your clothing brand. But before your customers can feel your products and try them on, the appearance of your designs must first attract them. That’s where the look book comes in. A look book is essentially a high-quality catalog for your brand showing off your clothes’ best sides and making a striking first impression on potential buyers. Working with the best clothing manufacturers is crucial to building out your fashion line. And the best among them, such as full-service clothing manufacturers Indie Source, will also help you develop a stellar marketing plan and look book. This is essential to getting your brand in front of people and driving sales. Here are a few tips to either improve your existing look book or to create your first one. There are a few different formats that look books utilize, and part of that can depend on the audience your look book is being created for. For brands selling directly to retailers and specialty stores, for instance, the look book will most certainly include wholesale pricing and styling numbers. A look book made for direct to consumer only brands, however, won’t include these details, but will still serve as a great way to show potential customers how the styles merchandise together and tell a cohesive story. Some look books are purely digital for online use only while others are printed on glossy paper in a hardback book. Some choose a minimalist approach showing only the products without descriptions, and others have paragraphs describing the clothing, the materials, and the experience of wearing it. The choice is yours, but consider how you’d like to brand your clothing line first and choose a layout and format that speaks to your target audience, be it retailers and specialty stores or direct to consumers. In the fashion world, brands are everything. Consider that you can buy a plain black T-shirt from hundreds of brands. When products become commodities, it’s the brand and the shopper’s connection to the brand that will drive the sale. Besides showing your products in the best light, your look book is your tool to differentiate your brand from competitors. Your look book should have your products front and center, but consider who will wear your clothes and when. With real people placed in real-world environments in your look book, you’re helping potential buyers picture how they (or their customers) can wear your clothes, and they’ll start to build a connection with your brand. How your models are posing and the settings of your shots will vary depending on your brand, so make sure that you’ve ironed out your branding beforehand and have a clear vision. The quality of your look book directly reflects the quality of your brand to buyers and customers. For this reason, you should work with professionals in every step of creation. This means you should hire professional photographers, models, designers, and anyone else needed to create a premium look book. This process can be time-consuming as you work with multiple people and companies, but you can get high-quality work and guidance from experienced professionals in one place from full-service US clothing manufacturers like Indie Source. They’ll help you not only design and produce your clothing line but will also help in the marketing phases and assist you in creating the best look book for your brand. Indie Source is among the top clothing manufacturers in the USA as they offer full-service clothing manufacturing to help you go from idea to finished product. They work with a variety of people and brands from individuals with an idea who are new to the fashion industry to established brands. Either way, you’ll receive their full attention as you create your product line together. From development to manufacturing through the marketing phase, you can count on Indie Source to help guide you on the best path forward. The company is based in the fashion district of downtown LA and has an experienced team of designers, domestic manufacturing partners, and in-house fashion marketing experts to help you bring your vision to life. You’d be hard-pressed to find an industry more driven by trends than the apparel market. Every year something new is in and something old is out, and it’s up to brands to predict these trends accurately and swiftly, or they could miss out on capitalizing on the latest and greatest. Keeping up with fashion trends can be challenging for brands and manufacturers for a variety of reasons, the most evident being the rate at which these trends come and go. The thing is, understanding what your customers are looking for months in advance will allow you time to produce a line and get it on shelves fast. Here are a few tips to help you stay ahead of the curve and design and deliver products that stay on top of trends. If you want to stay on top of the trends, you need to have a pulse on what your target customers are looking for and what they want to purchase in the coming months. To do this, your data analytics system should cover multiple channels and be highly targeted. You should know or identify exactly who you’re designing products for and then you can start looking at what this segment is most interested in. While in the past learning this information was challenging, the digital age makes it simple as long as you’re plugged in and paying attention. Utilize data from your social media channels to see what your target audience is talking about, what they’re wearing, and what they’re searching for from the clothing industry as a whole. While knowing what your customers want and predicting the next trend is important, if you aren’t able to produce your goods quickly, you could miss the boat. Working with domestic US clothing manufacturers with short lead times and quick manufacturing processes will help you get your products out there just in time to capitalize on the trend. Understanding the current market and producing garments is only part of the equation. Even with the best products you still need to compel your target customers to purchase from you and not a competitor. To do this, you need a strong brand that highlights the consumer experience. Your e-commerce platform should be optimized for shoppers with an integrated social media and marketing strategy that drives visits to your online store. People should care about your brand and connect with it either online, in-store, or both. Whether you have an existing brand or are just starting up, investing in your brand and marketing channels can be just as important as the products themselves. It’s possible to create a trendy short-run product line while working with separate manufacturing partners and handling the marketing and digital integration with another firm or on your own. But, working with full-service clothing manufacturers like Indie Source makes the entire process seamless and saves you time, headaches, and costs. Instead of having to find and negotiate with suppliers, designers, and manufacturers individually, you can go to one place and work with experts in the fashion industry from start to finish. Starting any business or brand can be a risky endeavor, but it can pay off big time if you plan carefully, work with the right people, and have a little bit of luck (or positive press) on your side. The thing is, far too often people jump in feet first and make common mistakes that can cost them time, money, or even prevent their brand from launching. Let’s take a closer look at some of the most common mistakes startup fashion brands make, why they can hurt your brand, and how to avoid them. Many big brands work with companies overseas to produce their goods. The thing is, it takes a lot of time, years even, to create strong relationships with reliable suppliers and to negotiate price points down—which typically involves mass orders of thousands of units. In addition to this, overseas manufacturers don’t have to adhere to the stricter labor and environmental standards that US clothing manufacturers do. And while you might benefit from cheaper labor costs, manufacturing in countries without the human and environmental regulations like found in the US then puts your company in a bit of a moral dilemma. Not to mention that overseas manufacturers often require large minimum orders and high tariffs, and many typically won’t give you your patterns or sourcing mill details. So if you ever have to move manufacturers you’ll be back to square one. Fortunately, it is entirely possible to work with US clothing manufacturers as a startup clothing brand. Indie Source, for example,offers full-service manufacturing and consultancy services for both new and established brands. You can leverage their network of suppliers and manufacturers based on your budget without dealing with the hurdles or headaches of going overseas. Branding and promotion are perhaps just as important as the quality of your products. Although consumers want to feel your products, as clothing is essentially a commodity for many, it’s the brand that will engage them the most. Consumers have thousands of options on the market for everything from T-shirts to pants—why should they choose yours? Make sure that you have all of your fashion promotional materials including lookbooks, model shots, and standalone images, and that you’ve identified the correct channels to distribute them for your demographic. To help with this, you should consult with a team of fashion experts that know how to build and market your brand to the customers you are trying to reach. Thanks to the internet and its endless amount of information, it may seem like anyone can launch or figure out anything nowadays. With that in mind, there isn’t a 10-step guide online that will cover all of the tiny details that can determine the success or failure of a startup clothing brand. Much of this understanding comes from experience. So if you’re choosing to go at it alone, thinking that you can launch a brand as a side hustle, you’re setting yourself up for a rude awakening—especially if you’re new to the industry. From mapping a budget and negotiating with clothing manufacturers to testing materials, creating lookbooks, and shipping your products to retailers, there are a lot of steps and variables in the clothing design, manufacturing, and marketing processes. To overcome this, you can hire a team of employees or freelancers with experience in the fashion world. But unless you have unlimited capital and support from investors, paying salaries for a team or hefty freelance fees might not be an option (you’ll also have to find said experts first). A wise alternative is to opt for a full package, domestic clothing manufacturer that has a team already in place with fashion experience and knowledge you can utilize to help drive your fashion startup forward. The best clothing manufacturers will help you with every step along the way from design and manufacturing to marketing sales. With that in mind, if you’re a smaller clothing brand or are just starting your line, are there benefits to launching your own pop-up shop? The answer: absolutely. Here are a few reasons why emerging and established clothing brands alike should consider it. Pop-up shops are a fantastic tool for generating buzz and getting people talking about your brand. There are tons of websites and blogs online dedicated to finding pop-ups in major cities, and if you market your pop-up well, you can get the attention of bloggers, journalists, and spark a social media wildfire. This can’t happen on its own, so make sure you’re working with the best full-service clothing manufacturers that will help create digital assets for your brand and provide you with advice for marketing your brand and pop-up shop. People love flash sales and limited-time offers. It creates a “fear of missing out” type of urgency, and when the rules of supply and demand come into play, consumers will take action. As it’s only open for a short while, a pop-up shop can drive excitement toward your brand as it creates a short shopping event—driving customers to make a purchase before the shop closes. With the right marketing behind the pop-up to raise awareness beforehand, you could potentially see a line around the block of eager fashion fans ready to buy up everything you have in stock. When searching for clothing manufacturers in the USA, some may assume that they are all the same and the process is as simple as placing an order and paying the bill. While you can go about it this way, it rarely works out well in the long run. 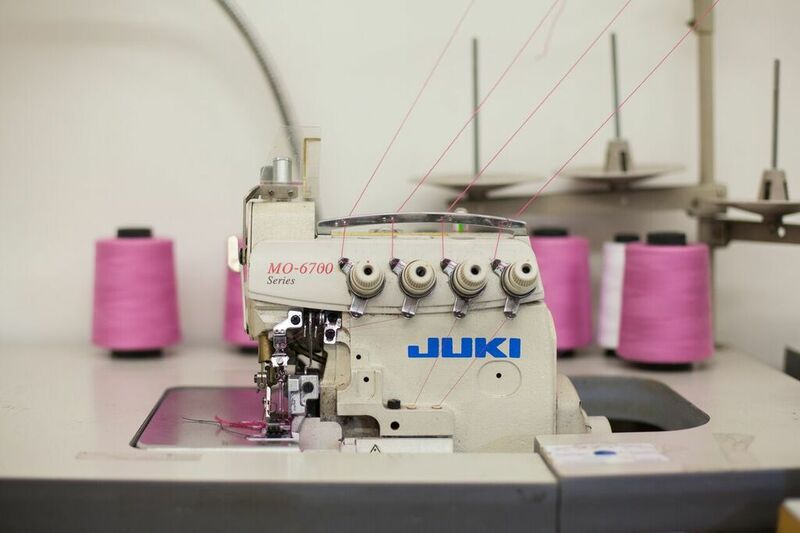 Building a strong relationship with the company that will produce your clothing is crucial in ensuring that your true vision comes to life and that you can sustainably grow the brand over time. While purchasing clothes off the rack is a simple transaction, when it comes to designing and manufacturing your clothes, your collaboration with the manufacturer should go deeper than paying the bill. The apparel market is complex, and if you’re new to the clothing industry, you’ll find that it’s challenging to determine the right designs to move forward with, the correct fabric types for the style, your budget, and a variety of other details. When you have strong relationships with clothing manufacturers, you’ll have more control over the end product, and they’ll help you along the way. Also, once the relationship is established, the manufacturer will be more willing to work with you on changes to the product as the industry and your vision change. Think about the personal relationships you have in your life; if your best friend of 10 years needed a ride from the airport, you’d drop everything to help them, but a complete stranger? You might not be so eager. The same is true in business. When you work with an apparel manufacturer for a while, they’ll start to learn more about your goals and vision for the product line. The best manufacturers will even work with you from the start, helping your line grow from an idea to a finished product. With a better understanding of your goals from the beginning, a clothing manufacturer can more clearly see what you require out of the final product and leverage their experience to consistently deliver on your requirements. Unless you want to limit your brand to only exclusive runs, your end goal is most likely to expand it and start shipping more units to retailers or directly to customers. To do this, you need to scale over time, something that’s easier to do when you work with the same clothing manufacturer. It’s also much more feasible when you work with a full-service apparel manufacturer who can help in the design, production, and marketing phases of your line and subsequent expansion. With a strong relationship with your clothing manufacturer, scaling your product can be as simple as investing more in the product line. The manufacturer already knows how to produce your products and what it takes to make each piece, so they can adjust their plans accordingly. If you were jumping between different suppliers and manufacturers, you’d start at square one each time and would have to go through the prototype and testing process yet again. Finally, it’s important to discuss the relationships that your manufacturer has with its suppliers, fabric mills, workforce, etc. You want to choose a clothing manufacturer that has taken the time to establish mutually successful relationships with their partners. It’s important to ask about this from the start so you can know going in that the quality of your products will remain constant, using the same materials and craftsmanship throughout the line. Indie Source is among the top full-service US clothing manufacturers. They are a one-stop shop for new and established clothing brands and have experienced design, manufacturing, and marketing experts ready to help you every step of the way. Whether you are looking for a clothing manufacturer for your next line or have an idea but don’t know where to start, Indie Source will help bring your vision to life. Working with clothing manufacturers either overseas or in the US presents its challenges. And, just like how you carefully try on clothes before you make your final purchasing decision, you need to select which manufacturer will produce your clothing line carefully and deliver the quality you’re looking for. As you start your search and get into contact with clothing manufacturers, keep these questions in mind to help identify if they will be a good fit for your brand. 1. Who do they work with? Knowing the brands that clothing manufacturers currently work with can give you a feeling for the quality of their production. If they work with big-name brands that you’re familiar with, it says a lot about their quality of work. These relationships can also provide insight into their reputation within the industry and more. 2. Will they work with your budget? As with any manufacturing endeavor, budgets start as immovable constraints placed on the project. But once the needle hits the fabric—especially if there are any snags in production—the final cost to manufacture can add up to be surprisingly high. For this reason, it’s crucial that you discuss your budget with the clothing manufacturer and make sure that they can realistically stay within it. It’s also worth keeping in mind that sometimes determining the final actual cost to produce the product isn’t always possible until you receive a prototype. Or at the very least, it might be easier to determine once a sample is made. Then the manufacturer can provide a more up-to-date estimate of the cost to produce based on how long it took, the materials used, and other factors. The best clothing manufacturers in the USA will work with you before production to help identify target manufacturing costs. They’ll take the time to give you an accurate estimate at the start rather than a flexible ballpark figure. You want your clothing manufacturer to be realistic and carry out every step of the process with a goal to hit costs. 3. Do they have experts on hand? If you’re new to the clothing industry, you’ll likely need guidance as you get started. From designing the products to choosing the right materials and even how to promote them, finding and selecting consultants on your own can take time and their fees can be expensive. To help guide the way, you should look fora clothing manufacturing company that has a team of experts willing to work with you throughout the entire process. From conception to selecting the materials, and even marketing your new brand, having industry experts with experience will go a long way in ensuring your line is successful and scalable for the future. Most clothing manufacturers don’t offer this array of services, so be sure to look for an innovative company that serves as a full-service apparel manufacturer and fashion consultancy. 4. What won’t they do? It’s easy to think that all manufacturers offer the same services, work with similar materials, and create all styles of clothing, but you’d be surprised by the number of things a prospective clothing manufacturer won’t or can’t do. In many cases, if they can’t do something, they’ll outsource it to someone else. You should avoid this as it complicates your supply chain and increases costs. Instead, look for manufacturers that do everything in-house and offer additional services like branding and marketing, so you only have to work with one company to launch your clothing line from start to finish, saving you time, money, and a whole lot of stress. The fashion industry generates immeasurable benefits for the economy and society at large. From job creation to economic productivity to artistic empowerment, fashion has long been valued as a mainstay of any society. In this day and age, however, consumers and businesses alike are interested in the environmental impacts of clothing manufacturing, and for good reason. Fortunately, consumer demands and corporate conscience are driving more sustainable business operations, and it is now easier than ever to build more eco-friendly practices into your partnership with clothing manufacturers. Manufacturing your clothing line domestically is one of the best ways to ensure a more environmentally conscious process, since US clothing manufacturers are held to higher environmental standards than foreign operations. Domestic manufacturers must adhere to rules and regulations set by the Environmental Protection Agency that govern many aspects of manufacturing, including wastewater compliance, chemical disposal, air pollution, and others. In the age of “fast fashion,” where unwanted, lightly-used clothing gets discarded with ease, the fashion industry is looking for ways to reuse, repurpose, and recycle textile fibers and materials. Finding a way to incorporate recycled materials can dramatically reduce the need to extract and produce new raw materials. This can also reduce the chemicals and water used to create new fabrics, which can range from bleaches and solvents to dyes and acids. If recycled materials aren’t possible, consider opting for alternative, eco-friendly options such as bamboo material, natural wool, and chemical-free dyes. For example, bamboo is sometimes used as an alternative to cotton since it requires minimal water to grow and can regrow after harvesting, reducing water use and deforestation. There are various ways to process bamboo into a raw material, so be aware of eco-friendly versus non-eco-friendly methods. It may not work for every clothing manufacturing operation, but natural dyes have been around for centuries and are a viable, eco-friendly way to dye certain fabrics. Plus, natural dyes from fruits and vegetables will not require the same harsh solvents as traditional dyes, thereby reducing harmful wastewater and pollution. Incorporating more sustainable processes into your clothing line may not always be easy, but studies have shown that consumers are increasingly demanding and will pay a premium for environmentally and socially conscious products. If it’s feasible, consider ways that these sustainable practices can help boost your fashion line, both in terms of operations and branding.